It is with great sadness that we announce the passing of Gwen Morrow on January 18th, 2019 at the Dr Everett Chalmers Hospital, Fredericton, NB. Gwen was born December 20, 1945 to the late Cliff and Audrey Murphy in Saint John, NB. Gwen is survived by her loving and devoted husband of 57 years George Morrow, her children, Darren Morrow (Nathalie) of New Maryland, NB, her daughter Karen Ritcey (Joel) of Waasis, NB, her grandchildren, Thomas Ritcey (Alisha), Katelyn Murphy(Lee), Alyssa and Sheena Morrow, her great grandchildren Jackson, Weston, Claire and Jake. Gwen is also survived by her sister Barbara Land (David) and brother Rick Murphy, her uncle Bob Campbell (Bev) and several nieces and nephews. Gwen was predeceased by her parents Cliff and Audrey Murphy, an infant brother Brian and her sister-in-law Jean Murphy. Gwen was devoted to her family who will all miss her tremendously. Gwen worked in several retail businesses and after retiring had a ceramic business for several years. 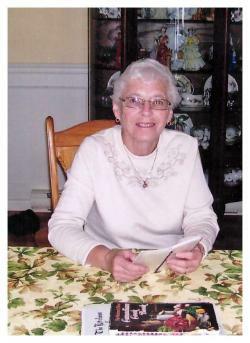 Gwen was also an avid golfer and was a member at Gilridge Golf Club. Her and George became snowbirds in the last decade and a half and were able to golf year-round. Gwen was also a member of the New Maryland United Church and the UCW. There will be no visitation and a service to celebrate her life will be held at the New Maryland United Church Friday January 25th,2019 at 2:00 pm with a reception to follow at the church. Reverend Dr Kelly Burke will officiate. In lieu of flowers a donation may be made to a charity of the donor’s choice.